Tomorrow I will be refreshing my life saving skills at a First Aid course and given the amount of injuries that are suggested to have happened at music concerts, you might just be glad I bothered! Various head injuries caused by drumsticks and other objects being thrown into the crowd, read here. ...and of course the occasional bruised ego which I don't believe will be covered in my course. Apart from the odd bout of brief post show deafness and having my foot stepped on more often than I care to mention I have generally fared pretty well, but then again I've never hung around mosh pits which is where I'm sure a lot of the injuries I mentioned have occurred. All good stuff worth spending a few minutes reading up on. Go on, knock yourself out with it and hopefully by the end of tomorrow I'll know how to help you. If you have a story to share about an injury at a music concert, please leave a comment! The worst thing I've seen at concerts is people passing out. When I was at the Osheaga festival a few years ago I saw at least 3 different people pass out. It's kind of shocking to see. They get really pale and their eyes start to close and then bam they're down. Scary stuff. I, luckily, have never been injured at a show. I did lose a show once, but I found it. Well, this isn't at a concert properly, but at a party at a friends house when i was 15. We were listening to Rage against the Machine, or something like that, and headbanging when i managed to headbang straight into a radiator. It was only a small cut that required a couple of stiches, but looked quite impressive and bloody - so much so that people with much worse injuries at the hospital kept insisting that i be seen by the doctors before them. Probably the worst injuries that can happen at small concerts are from moshpits, but the worst are in big stadiums where people get trampled. 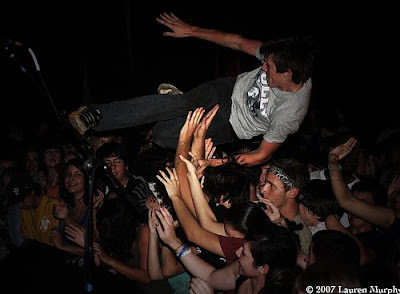 Personally, I've always wanted to go crowd surfing.